It has been a slow and steady improvement for Raytown the last four years. The Blue Jays have improved their win total every season and they opened practice Monday with a high amount of enthusiasm for the upcoming year. Raytown just missed out on the playoffs last year finishing 5-5 but the strong numbers on the first day show there is a great amount of interest in the football program. Coach Kevin Page said that interest was there all summer and now that games are less than three weeks away the team came in ready to get to work when camp started. “Day one is huge for us,” Page said. “It’s kind of a culmination of the weight room from June to the end of the school year and the 25 days of contact throughout the summer and the kids are really, really, really excited. 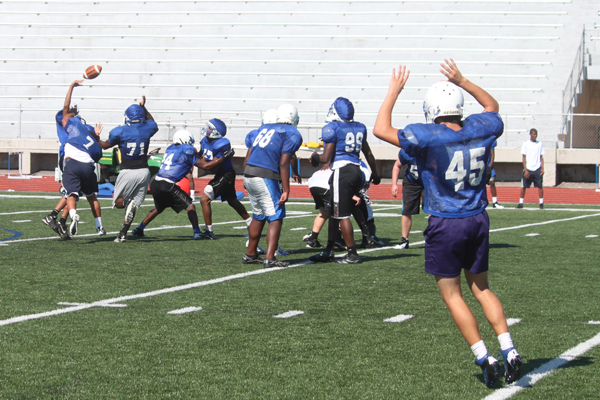 The marked improvement last season came as Raytown was putting in a new offense and defense. Now in the second year of those changes the Blue Jays could make significant strides on both sides of the ball. Page said the team has a good grasp of what it needs right now and from here the players can just work on getting better each week.